Prior to making this dish I had never roasted a radish before, I didn't even know if roasting radishes was a thing people did. Well, if it's not something people do, it should become something people do because these puppies were delicious. I tossed them with fresh tarragon, oil, and little white wine vinegar before tossing them in the oven with a few fillets of tilapia. I recommend radishes with the stems and greens still attached - they'll be fresher and more beautiful, and you can use the greens for a salad or pesto or some other, more creative options. 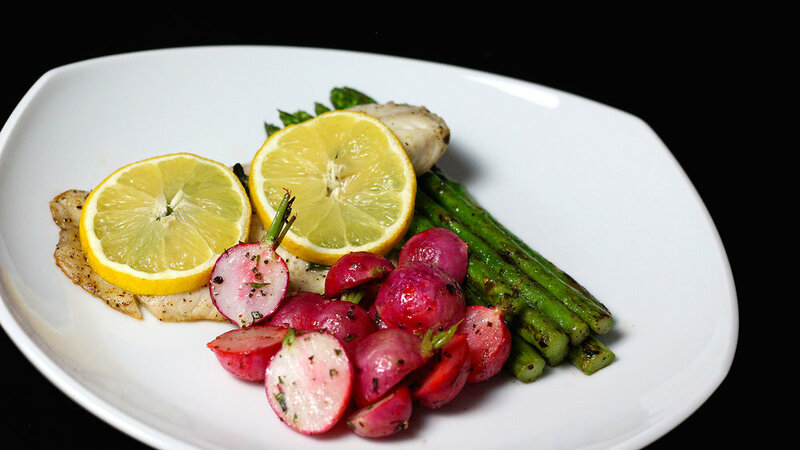 The fish received much the same treatment as the radishes, some oil, fresh tarragon, and some slices of lemon for acidity. The tarragon for the fish is left mostly in whole leaves. I roughed 'em up a bit by crumpling them to release some oils, but you can leave them whole. If I have one regret with this dish, it's that I put too many damn lemon slices on top of the fish for the picture. One would have been enough! Come on!